We are a manufacturer, supplier and exporter of Industrial Lyophilizer. This drying chamber is on the left, connected to the separate cylindrical ice condenser via diameter isolation valve. On the extreme right is the refrigeration system, including water-cooled compressors, and a series of heat exchangers to cool or heat the circulating brine. The front of the drying chamber will be sealed into the wall of the clean area. 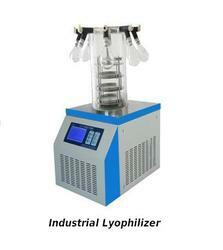 Industrial Lyophilizer is applicable for freeze-drying test of laboratory samples and suitable for small amount of production. FD-10-MR include the following types: Regular type, Top-press type, multi-manifold T type and multi-manifold Top-press type.